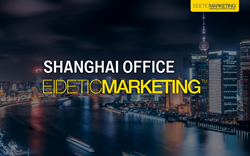 Global integrated marketing agency Eidetic Marketing announced the establishment of Eidetic Marketing China on February 18th. Eidetic Marketing will provide helpful consultation services to formulate the best marketing strategies for companies at any stage. Eidetic Marketing is an integrated marketing agency headquartered in North America. As an esteemed partner of many global corporations, EM provides comprehensive marketing solutions to clients from more than 20 different countries. One of the most thriving territories for EM has been, in recent quarters, the Chinese market. Whether the marketing campaigns in China are inbound or outbound, Eidetic Marketing has been very active in the Chinese market in various industries. Recently, one of Korea’s leading steel industry corporations, POSCO, partnered with Eidetic Marketing for the key objective of expanding its business reach in Beijing, China. In other industries, such as gaming, Eidetic Marketing effectively executed marketing campaigns for China’s most popular companies, such as Tencent and NetEase. Eidetic Marketing has seen significant growth in global corporations’ adoption of integrated marketing solutions. In 2015, 75% of their revenue was generated from large scale campaigns with global corporations, especially in the Chinese market. So, in order to fulfill clients’ needs to expand into the Chinese market, Eidetic Marketing founded Eidetic China to become a bridge between the U.S. and Chinese markets. With this strategic network, Eidetic Marketing is expecting to become an interface of integrated marketing services for major global territories. This vital bridge will be sure to provide clients access to valuable insights and competitive advantages for their products and services in the Chinese market. “China is one of the highest growth potential markets in the world. Therefore, many companies keep their eyes on expanding their businesses into China. From long established corporations to new startups, Eidetic Marketing will provide helpful consultation services to formulate the best marketing strategies for companies at any stage. With Eidetic Marketing China, EM will have access to direct “on-site” market information, and this will be the core ingredient in creating truly effective marketing solutions,” said Ashley Jung, CEO of Eidetic Marketing.